It's week 2 of Charly from PODCast's new black and white photography project - see her Week 2 London Eye photo and post on Inspirational Photographer Ansel Adams, a favourite of mine since we saw some of his work when we visited Yosemite National Park back in 2000. This week I've chosen a photo of Holkham Beach in Norfolk taken in May 2012. Holkham is a great beach and like many of Norfolk's beaches has vast stretches of unspoilt sand, and walking on untrodden sand is a bit like walking on freshly fallen snow - you want to put your footprints everywhere... Or I do anyway! 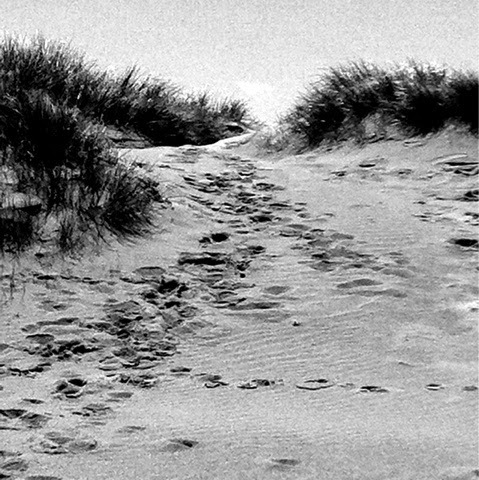 It's the footprints I like in this photo, the criss-cross and mish-mash of textures that immediately transport me back there climbing up the dune so I can see the sea! And btw, these aren't all my footprints!